Accountant and Jr Technical Assistant Jobs. There are total 23 vacancies in Bharatpur district collector office vacancies. For both posts computer knowledge is mandatory. Interested candidates can submit their application form to collector office of Bharatpur district in a specific format is on or before 30-11-2017 along with the required documents. Shortlist or final list will be held through based on candidate’s academic qualifications for this Bharatpur District Accounts Assistant Jobs. 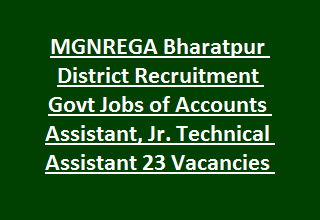 Bharpur district MGNREGA recruitment of Junior Technical Asst and Accounts assistant recruitment vacancies details are given below. Filled application form along with necessary documents to be reach Collector office Bharatpur district is on or before 30-11-2017. There are total 23 no of posts available in this Bharatpur district recruitment 2017. Lower age limits is 21 years and upper age limits is 35 years and age relaxations are applicable as per the norms. For Accounts Assistant Jobs-B.Com Degree qualification with Computer Knowledge certificate is required. For Jr. Technical Asst Jobs-Diploma in Civil/Agricultural engineering or its equivalent qualification required. Candidates will be shortlisted for documents verification or interview based their academic marks. Preference will be given to higher percentage having candidates. Merit list details are other important details will be published in official website of Bharatpur district @bharatpur.rajasthan.gov.in. Preference will be given to the candidates those who are already having work experience in govt offices. If you are having the necessary qualifications then download the applications form from bharatpur.rajasthan.gov.in website. It is mandatory for submission application form to bharatour district collector office on or before 30-12-2017. Notification for Bharatpur district recruitment of Accounts Assistant jobs.